Amon-Ra Dates: January 8 – 21, February 1 – 11. Traits of Amon-Ra people: Generous, Successful, Helpful. Lucky Colors: Yellow for men, Orange for women. Associated Zodiac Sign: Taurus ♉. Compatibility: The Nile and Horus. The Supreme deity of the Sun has many names - Amon-Ra, Amon, Amun. 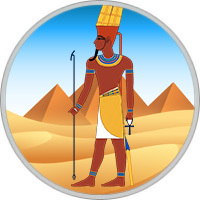 In the myths of the ancient Egyptians, it combined the characters of the three gods: Ra (actually the sun god), Mina (god of creation) and Mont (god of warriors). He was depicted with a ram’s head, or with a man’s head, but decorated with mutton horns or a solar disk. His wife was Mut, the Mother Goddess. The children of Amon-Ra are powerful and integral in nature, imbued with sunny optimism. In the team, they quickly become leaders, without taking any effort. People are drawn to them and willingly obey. However, their weak point is flattery. If you praise them, they will be ready to roll mountains. They adore fame and public recognition. Nature has endowed them with wisdom and a supernatural gift to see the future, so among them often there are prophets. These people are characterized by oratory and the gift of persuasion. They can enthrall the crowd, inspire others to act and carry out great changes, even to revolution. Their popularity is supported by itself, everyone is proud of friendship or at least acquaintance with them. At the same time, they can easily soothe and encourage people. However, do not think that they are simple-hearted and unsophisticated. They pursue their personal goals, using the art of diplomacy, sometimes surreptitiously, always prudently and thoughtfully. In their personal lives the children of Amon-Ra find it difficult to find a suitable partner. He needs sensitivity, readiness to play the second violin, while always supporting, but most of all - approve. People born under the auspices of the Supreme God of the Sun are reluctant to open their souls and share their plans, which is why they often have scandals and misunderstandings in the family. Native leaders who are ready to shoulder the whole burden of responsibility on their shoulders. They tend to be the best and do not get tired of proving it. The man of Amon-Ra sign should be praised, so that he had the motivation to continue to do something more. A holistic person attracts attention to his person due to charisma and charisma. Thanks to the skillful possession of the word, they convince everyone that they are right and love to observe the reactions of others to their actions. This man wants to be popular, and puts his career first. It is necessary to find time for close people, otherwise you can remain in proud solitude. The woman born under this egyptian sign is able to manipulate others. She is ready to go on the heads, if only to achieve the set goal. You can safely use all the means, showing cunning and acting in secret. The Amon-Ra woman does not let extra people into her life. She behaves in a concentrated way and never talks about plans to others. The key to the success of this young lady in her concentration, confidence and tranquility, which she does not get tired of demonstrating to everyone around.